BeenThere-DoneThat: The area around Marlborough, Wiltshire. Marlborough is on the old coach route from London to Bath and is now on the A4 road which used to be the main route for modern traffic from London to Bath until the M4 motorway by-passed it to the north. It is still busy with traffic, however, and traffic queues along the high street are not unusual. 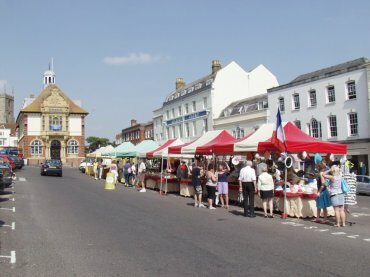 It is a market town and there seem to be market stalls set up in the middle of the High Street on most days although market days, which originate from the charter of 1204, are officially on Wednesday and Saturday. We stayed at the Castle and Ball Hotel during our visit to Marlborough. Savernake Forest touches Marlborough's South-East corner and covers about 4,500 acres with the longest axis being about 3 miles. 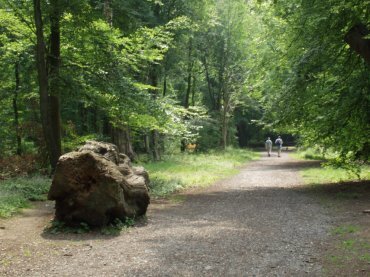 We asked about Savernake Forest in the Tourist Information Centre in Marlborough and were told that it was in private ownership (right) and access to the public was restricted to the paths only (wrong). Access is open with the public being able to walk anywhere they choose except for any fenced off areas. There is also a drive, Grand Avenue, where you can take your car from one end of the forest to the other. 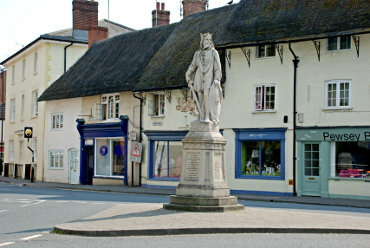 The small town of Pewsey was once owned by King Alfred (Alfred the Great) so it's no surprise to find a statue of him at the junction of High Street, North Street and Church Street. Pewsey is to be found six miles south of Marlborough. In the rectangle which has the towns of Marlborough, Pewsey, Devizes and Calne as its corners is an area of high ground of which Pewsey Downs forms part. 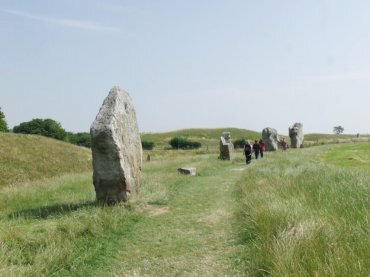 Avebury, Silbury Hill and West Kennet Longbarrow are about 6 miles West of Marlborough just North of the A4 road. Avebury is famous for it's stone circle which is larger and older (5500 years) than Stonehenge. Just 20 miles south of Marlborough standing on Salisbury Plain is Stonehenge. Not as large, or as old, as Avebury this 4800 years old monument has dressed stones with a much more uniform shape. 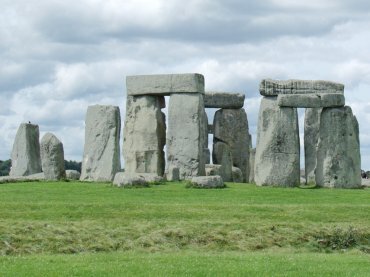 The stone from which Stonehenge is made comes from near Marlborough.